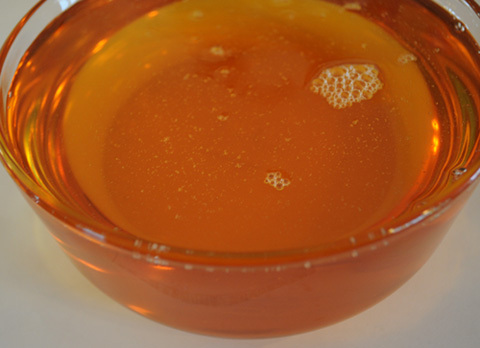 Today, I am going to write about how to make your own golden syrup. This ingredient shows up commonly in baked goods and a wide variety of desserts. When you use it at home, it gives baked goods a hint of extra freshness. Golden syrup is also the starting ingredient to many baked goods and pastries, such as cakes (Mooncakes!!) and breads. One of the most common brands of golden syrup is Tate and Lyles, and it is available at many specialty food stores and online. So what exactly is golden syrup? Commercially speaking, golden syrup is produced during the refining process when sugar cane juice is turned into sugar. It can also be made by treating a sugar solution with acid. The latter procedure is what I am going to show you today. I think homemade is always better than store bought and lets you bypass all the unnecessary additives. We use only natural acids like lemon juice and vinegar in this recipe, so everything is 100% natural. Sometimes, molasses, corn syrup and honey are used as substitutes for golden syrup, but I have found in my own baking experience that the result is not the same for certain recipes that call specifically for golden syrup. Now, there is no reason to take the risk by substitution because I am going to show you how to make golden syrup at home. Here is the recipe. The recipe is precise. I recommend using the metric measurements, but if you must use the cup equivalents, please measure carefully. Anytime when we work with a solution, we have to turn a kitchen into a "lab" mentality. Precision is important, and I also don't want to give you a recipe that doesn't work and waste your time and money. :) Here we go. 1. Wash the lemons and squeeze out all the juice into a bowl. Set the juice aside and measure out 6 tablespoons. Then, cut the lemons into quarter wedges and set aside. 2. Next, in a small sauce pan, add sugar and water and boil on high heat until the sugar has completely dissolved. Stir to mix frequently. 3. 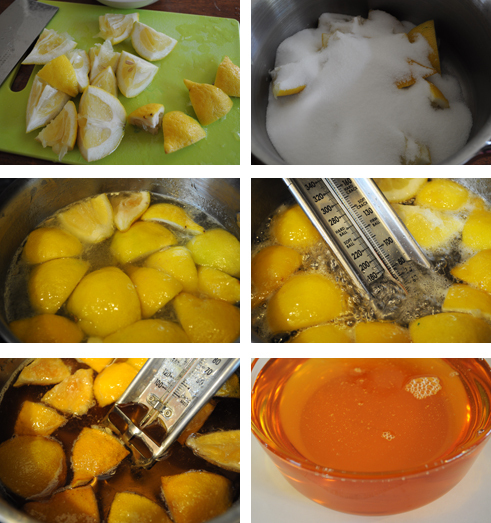 Lower the heat to a simmer and add lemon juice, lemon wedges and vinegar (This is the acidic component of the syrup). Stir occasionally. 4. Insert a candy thermometer and continue to boil on medium heat until the solution reaches 108⁰ C. Now, you may think that since boiling point of water is 100⁰C and since 8 degrees is only a small increment higher so this process should only take a few minutes. But that would be wrong. The solution at this stage is very saturated with sugar and acid. In order for the solution to absorb enough energy or "heat" (Chemistry folks will remember q=mCΔT, sorry, I couldn't resist! For the rest of us, this is just a scientific equation that shows the relationship between heat and time needed to raise temperature in a solution.) To get the solution up to 108⁰C is going to take about 30 minutes or more. You have to trust the reading on the candy thermometer. Along the way to this temperature, the sugar solution will automatically turn into a golden color. 5. Once the thermometer indicates 108⁰C, turn off the heat. Stir in the baking soda solution. 6. At this point you will notice bubbles coming up to the surface of the solution. Once the solution cools, it will disappear. Let the solution cool in the sauce pan and strain into the storage jar (preferably glass). Best used within a month. Keep refrigerated. Now you can make this at home! The solution could be too saturated. How long did you heat it for? Try adding about 1/4 cup of water and re heat. It should return to its liquid form. Thanks! It was as per instruction. It became golden brown after heating at simmer for 8 to 9 minutes and not after 45 minutes. Hi Dr. Rajesh, that doesn't sound right. Because I am not in the kitchen with you, I cannot troubleshoot what went wrong. But on the lowest setting on a residential stove (non-commercial-gas), it took 45 mins to get it to the nice golden brown color and it did not turn into a solid. I would try it again using a much lower temperature. I've got a couple of somewhat technical questions. I'm assuming that the baking soda is to neutralise the acid, but the quantity seems quite small in comparison to the volume of the acids; is it enough to neutralise all the acid? I'm also wondering if you know how much of the sugar is inverted in this process (or how to tell if it's all been inverted). Thanks for your post, this is great. You have to use lemons because orange may not be acidic enough. Thanks for reading! I tried making this but it has a nasty bitter taste - like from the lemon pieces. Any ideas? Thanks! Thanks for trying my recipe! Sorry this didn't work out for you. Too much lemon rind with white skin on it will make the flavor too bitter. How much lemon rind did you use? Hello there! I am Julie. This the Browncookie.com's official blog. Our mission is to bring you tools and recipes to bring out the "chef in you". Please feel free to drop me a note if you have any questions about a product or a recipe.